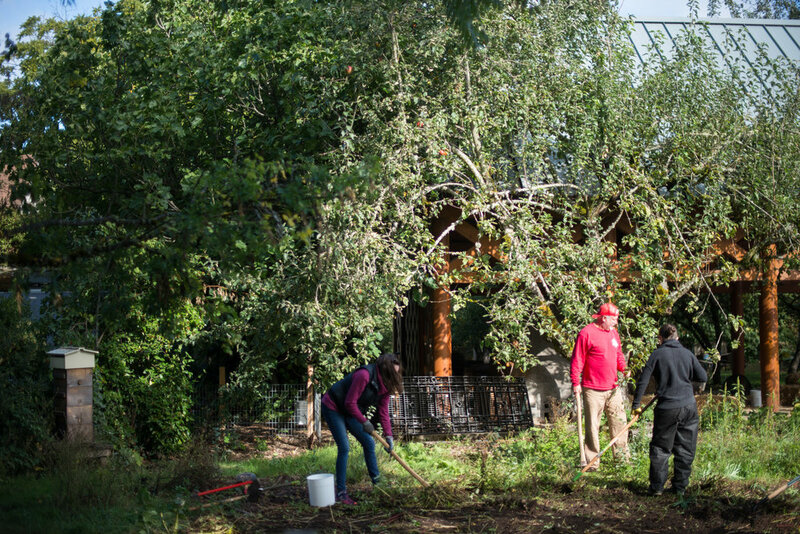 Can the Urban Farm survive construction of the Phil and Penny Knight Campus? "Genius, curiosity, and lots of money." Construction of the campus will come in several phases. The first of which, a $225 million, 160,000 sq. ft. building along the north side of Franklin Boulevard, will begin in early March and be completed by 2020. The University of Oregon released architectural renderings of this building in October. They show a sleek, silver building of six stories covered in large windows. On the first floor is a spacious public lobby, with mezzanines, meeting rooms and labs rising on the upper floors. It was designed by Bora Architects of Portland and Ennead Architects of New York, who said they aimed to encapsulate the aesthetic of the 21st century. Indeed, it looks like it came straight from the Silicon Valley. The possibilities that lie within these future walls seem almost endless, or in the words of a beaming Patrick Phillips, executive director for the new campus, “game-changing.” Others would certainly agree with that term, but with less optimism. Some UO faculty, particularly from the Landscape Architecture Department, have voiced concerns over how the new campus will shade the Urban Farm, which has been cultivated by students for over 40 years. Harper Keeler, director of the farm, said that he has tried to work with the building designers to mitigate harm to the Urban Farm, but that he was shut out from the planning process. When Keeler heard last winter that the design team was soon going to begin conceptual planning, he sent emails to the architect firms and university officials asking to be involved. They assured Keeler that they would notify him when the planning process would start. “The end of February, then March rolls around, nothing,” he said. Then, he received an email from the design team inviting him for an update on the planning process. “They pretty much had the building done and said this is what’s going to happen,” he said. Keeler said that from the beginning there has been a profound lack of interest in working with the College of Design and faculty from the Urban Farm. He and colleagues had even developed some ideas to integrate the farm into the campus’ buildings, like installing edible landscapes like those around campus intersections or building flower beds for pollinators. Keeler, referring to solar studies that the design team conducted upon request by the College of Design, showed that while the primary growing season – April through September – may not be largely affected by the building’s shade, come December, the farm may be completely sun-blocked during all daylight hours, from 9 a.m. to 4 p.m. The winter months, though not as bountiful as the spring and summer, are still vital growing periods. Leafy greens like spinach and lettuce are grown at this time and cover crops like clover help prepare the beds for spring harvests. Pollinators like bees also rely heavily on those cover crops to forage on warmer winter days, according to a report by Oregon State University. Keeler said that the designers don’t seem to understand that losing the sunshine in those winter months poses serious threats not just to the farm but to these organisms that rely on its crops. That isn’t to mention the 300 students that Harper says work and take classes at the farm every year. Winter term will be an especially hard time for students, who may not get to do much farming at all. Patrick Phillips, the Acting Executive Director of the Phil and Penny Knight Campus for Accelerating Scientific Impact, immediately reassured that the Urban Farm will not be impacted by the development of the new campus. Phillips also addressed the possibility of shade from the building affecting the Urban Farm and commented, “We did extensive daylight studies and it turns out [that the] big trees right along the mill race are actually the major source of shade,” referring to those solar studies. Those trees, Keeler said, do shade part of the farm in the summer, but that they will in turn be shaded by the new building. He added that the size of a tree is much smaller than a 160,000 sq. ft. building, and that they shade the farm for a much shorter period than a building that size would. Phillips hopes that the new Knight Campus will become a place for both undergraduate and graduate students to not only be able to operate at the highest levels of academia, but find practical ways to apply what they have learned to their intended career paths. Phillips explained that the true philosophy of the Knight Campus is, “Bringing students in and giving them education on campus and then immediately putting them into real world experiences.” He estimates that the Knight Campus will serve upward of one thousand students within a decade. With the Knight Campus predicted to bring in new science and tech companies to Eugene, there will be potential internship opportunities for students to utilize Knight Campus research facilities. Phillips predicts that more students will be able to stay in Eugene after college rather than travel to a larger city like Portland to pursue graduate degrees. Additionally, Phillips said he is particularly proud of the fact that the construction of the Knight Campus will not increase tuition in any way for students due to the $500 million dollar donation from Phil and Penny Knight. As for Keeler, he said that the new campus won’t be a death certificate for the Urban Farm, and he is hoping to have more involvement in the subsequent planning phases. “I have no other choice but to just be positive,” he said. Despite his frustrations, Keeler knows this is a complex process with a lot of stakeholder interests.